We went to So Coco Rouge for my best friends hen do to get glammed up for our night out. We all had a bouncy blow dry, makeup done and generally had a really lovely afternoon. Sian, Robyn and Kelly are all amazing at what they do and I can't recommend these guys enough! I am a new mum so was feeling very down and my overall look was very neglected to say the least but after an afternoon at So Coco Rouge I went from dull mum to GLAM mum!! Make-up = fab, hair = fab and girls = fab!!! Not only are they brilliant at what they do but the way they are made for a lovely atmosphere!! Absolutely Fabulous experience, thanks girlies I will be back!!! I cannot recommend So Coco Rouge enough!!! I've always had a great experience with them and my makeup has been gorgeous everytime! I booked them for my wedding next summer. I love the natural, light feel of the makeup from So Coco Rouge and it is perfect for my wedding when I need it to last all day and night! They're such a lovely team and I know I can trust them to help make my day extra special!!!! Everyone I have recommended the salon to has been and now don't want to go anywhere else. You're guaranteed to walk out feeling great!! Makeover was fab :-) very friendly, would highly recommend this salon. I was booked to sing for a launch night, and on arrival the organisers asked if I would like my hair and make up done my the So Coco Ladies, I was a little nervous as I suffer with spots and bad skin, but the ladies were fab, Sian asked me about what I wanted and covered my spots so you could not see them, and more importantly it looked really natural and not like I was covered in Make-Up! My eye make up was gorgeous too and Robyn gave me a real Audrey Heppburn hair style that was gorgeous, I was so happy after the gig, I went out on the town, my make up stayed fresh, and my hair stayed up! A brilliant job! Highly recommend to anyone who is in for a long night and wants perfect make-up the whole time! 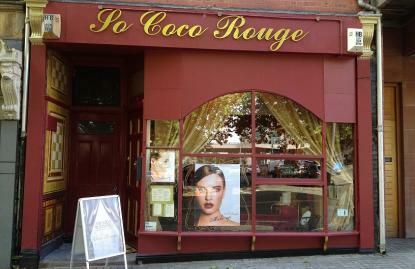 I was lucky enough to be pointed in the direction of So Coco Rouge, by a friend who is a regular client. The girls here are just lovely- so friendly, professional and highly trained and experienced! They were the perfect team for my wedding day! Robyn created stunning vintage inspired hair and make-up for my big day and I treated myself to some pre-wedding pampering (spray tan, nails and a course of facials) with beauty therapist, Katy. I think my favourite part of wedding planning was my trial, where Robyn insisted I try as many styles as possible in the time we had, so I knew I had found the right one for me! I wouldn't hesitate to recommend these ladies to anyone- everyone deserves a little trip to this piece of heaven! !